Your ears do the remarkable job of allowing you to hear a huge range of sounds, from a whisper to a loud band. To do this the ear transforms sound energy into electrical signals which the brain can interpret. Your ears also help to maintain your balance. The ear is roughly divided into three parts. The external (outer) ear includes the part you can see, called the pinna, and the narrow tube-like structure – the ear canal. At the end of the canal is the eardrum. This separates the external ear from the middle ear. The eardrum is a tightly stretched membrane, a bit like the skin of a drum. The middle ear is an air-filled compartment. Inside it are the three smallest bones in the body, called malleus, incus and stapes. These bones are connected to each other. The last in the group, stapes, also makes contact with the internal (inner) ear. The air space of the middle ear connects to the back of the nose by the Eustachian tube. The inner ear is made up of two components. The cochlea is involved with hearing. The vestibular system helps with balance. The cochlea is a snail-shaped chamber filled with fluid. It is lined with special sensory cells called hair cells. These cells transform sound waves into electrical signals. The cochlea is attached to a nerve that leads to the brain. The vestibular system is made up of a network of tubes, called the semicircular canals, plus the vestibule. The vestibular system also contains special sensory cells, but here they detect movement instead of sound. Both the cochlea and the vestibular system are connected to a nerve which carries electrical signals to the brain. Sound waves are created when air vibrates. To hear the ear must change sound into electrical signals which the brain can interpret. The pinna (outer part of the ear) funnels sound waves into the ear canal. When sound waves reach the eardrum they cause it to vibrate. 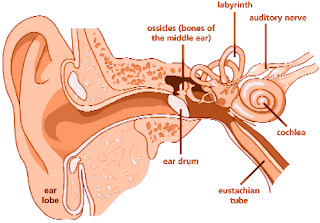 Vibrations of the eardrum cause the tiny bones in the middle ear to move too. The last of these bones, stapes, passes on the vibrations to the cochlea. When the cochlea receives the vibrations, the fluid inside it moves. As the fluid moves it causes the special sensory cells to create an electrical signal. This electrical signal is sent to the brain. Special areas in the brain receive these signals and translate them into what we know as sound. Your ears create electrical signals that represent an extraordinary variety of sounds. For example, the speed at which the eardrum vibrates varies with different types of sound. With low-pitched sounds the eardrum vibrates slowly. With high-pitched sounds it vibrates faster. This means that the special hair cells in the cochlea also vibrate at varying speeds. This causes different signals to be sent to the brain. This is one of the ways we are able to distinguish between a wide range of sounds. Balance is maintained not only by the vestibular system found in your ears but also by your visual and sensory systems. If any one of these systems is damaged, you may experience dizziness or loss of balance. The brain uses the visual system to help orientate us in our surroundings. The vestibular system detects both circular motion and movement in a straight line. This includes everyday actions such as stopping, starting or turning. The sensory system keeps track of the movement and tension of our muscles and joints. It also monitors the position of our body with respect to the ground. The brain receives signals from all these systems and processes the information gathered to produce a sensation of stability. The tubes and sacs within the vestibular system are filled with fluid. When we move our heads, this fluid also moves. The vestibular system also contains specialised sensory cells. Movement of the fluid causes these sensory cells to bend. This change results in an electrical signal which is carried, via a nerve, to the brain for interpretation. Once the brain has interpreted the signals as movement, it controls your eyes so that they keep providing information about your position. The brain also sends signals to your muscles so that they help to ensure balance regardless of the position of your body. This is when the eardrum becomes stretched and tense. It causes ear pain and dulled hearing. It is due to unequal pressures that develop either side of the eardrum. This most commonly occurs when descending to land in a plane, and in scuba divers. This condition causes short episodes of vertigo (intense dizziness) when you move your head in certain directions. It it thought to be caused by tiny fragments of debris in the inner ear labyrinth. When a doctor uses the term 'ear infection' he or she normally means that the middle ear is infected. The middle ear is the eardrum and the small space behind the eardrum. An ear infection is very common, especially in children, and is sometimes called 'acute otitis media'. Cells in the ear canal make earwax. A build-up of earwax can cause dulled hearing. This means that the Eustachian tube is blocked or does not open properly. Air cannot then get into the middle ear. Therefore, the air pressure on the outer side of the eardrum becomes greater than the air pressure in the middle ear. This pushes the eardrum inward. The eardrum becomes tense, and does not vibrate so well when hit by sound waves. The main symptom is muffled or dulled hearing. You may also have ear pain. This is a condition where the middle ear fills with glue-like fluid instead of air. This causes dulled hearing. Glue ear is very common in children. Labyrinthitis means inflammation of the labyrinth in the inner ear. There are various causes. The most common is due to a viral infection ('viral labyrinthitis'). Typically, with viral labyrinthitis you develop vertigo, and often feel sick or vomit. Vestibular neuritis is similar to labyrinthitis and causes similar symptoms but the inflammation is in the vestibular nerve coming from the inner ear rather than in the inner ear itself. This is a condition of the inner ear. It typically causes attacks of vertigo, hearing loss, and tinnitus (noises in the ear). It is thought that Ménière's disease is caused by slight changes and damage within the inner ear. This is an inflammation of the ear canal. The inflammation may be caused by infection, allergy or other causes. This is a condition of the middle ear which mainly affects the tiny stapes bone. It causes gradual hearing loss. This is a hole or tear that has developed in the eardrum. There are various causes, including infections and loud bangs. It may affect hearing. Presbyacusis (sometimes written presbycusis) is the medical term for hearing loss that occurs in older people as they age. It is the commonest cause for hearing loss in people over 55. This is an abnormal noise (or noises) that you can hear. 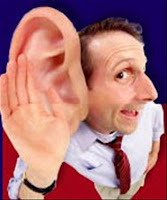 However, the noise does not come from outside your ear but originates from within the inner ear. The sort of noises that people hear include: ringing, buzzing, whistles, roaring, humming, machine-type noises, etc. There are various causes, but in many cases the cause is not known.